Valerian extract benefits provide a natural way to treat insomnia. Valerian extract delivers useful plant chemicals faster than dried valerian capsules and valerian teas, and extracts also work better for getting the most from products that combine valerian with hops and/or passionflower. But before you can really enjoy these herbal benefits, you need the answer to a very basic question: What's valerian extract. Extraction uses a liquid to dissolve the beneficial plant compounds from an herb. If you are getting your product from a traditional herbalist, you are most likely to be handed a bottle of a tincture of the herb made by soaking the herb in alcohol. The alcohol removes the active ingredients and leaves bulky fiber behind. Some people, of course, don't use products made with alcohol. Simple extracts are also made with hot water or with glycerin. Industrial processes may remove the active principles from an herb with hexanol or methanol, but since these solvents are poisonous, the hexanol or methanol has to be evaporated out of the extract before it is safe to use. And a few companies use an especially safe and environmentally friendly extraction process that uses liquid carbon dioxide as the solvent. Ordinarily carbon dioxide sublimates from its solid state (dry ice) directly to its gaseous state. Under high pressure, however, carbon dioxide becomes a liquid. The liquid carbon dioxide dissolves desired chemicals out of the herb, concentrating them for use in health support. Then as soon as the pressure in the production chamber is released, the carbon dioxide evaporates, leaving dry herb powder with no trace of toxic solvents. The carbon dioxide itself is captured in a containment vessel so it can be re-pressurized for treating the next batch. When you make valerian tea, you are actually making a hot water extract. The problem with making a tea is that you might get distracted and take the tea bag out too soon or leave it too long, so you don't receive a reliable dose of the herb. Sometimes your valerian tea make you too sleepy too fast and sometimes it might not make you sleepy enough. Using encapsulated freeze-dried valerian that has just been chopped up and dried poses the same problem. Although herb manufacturers use their knowledge of the plant to pick the herb at the peak of potency, sometimes the plant does not cooperate by delivering the expected amount of active ingredients. Extracts can be standardized so you get the same valerian extract benefits each and every time. You can get dry extracts in capsules, and fluidextracts (which is just one word) in products you take with a dropper. But maybe you also need to know what valerian is and what it does? Valerian is a small leafy plant that has been used in herbal medicine since the time of the Roman Empire. It was not named after the Emperor Valerian, but the family of plants was named after the family of consuls and emperors that ruled Rome for nearly 1,000 years. This name also appears as Vladmir, Valdamar, Valdemar, and Waldemar later in history. The colloquial name of valerian in Roman times was "phu." If you have ever picked fresh valerian and smelled your hands afterwards, that's what you would say. Valerian has a distinctly unpleasant and slightly nauseating smell when fresh, but it's used after drying or extraction in herbal medicines. There is also a "red valerian" that is a popular ornamental flower. Red valerian has red flowers. This plant is edible, but it is not medicinal. The medicinal valerian plant has white flowers. Valerian has been carefully studied for over 100 years and is described in over 650 scientific publications. Plant scientists have identified specific valerian compounds that interact with the human brain in specific ways. Alkaloids such as actinidine, chatinine, syanthine, valerianine, and valerine have the same function in the human brain as catnip does for cats. If you feel like purring after you take valerian, it was probably due to the alkaloids. In the valerian plant itself, these compounds serve to lure insects to parts of the plant they can't eat. Flavanones such as hesperidin, 6-methylapigenin, and linarin lower blood pressure and stop muscle twitches. This indirectly reduces activity in the brain. In the plant itself, the compounds help it deal with drought, and a valerian plant that has been drought-stressed during the summer is more likely to put you to sleep when you use it to make a tea. Gamma-aminobutyric acid, also known as GABA, is the chief inhibitory compound in the human nervous system. This compound defends the valerian plant in nature from being eaten by goats and sheep. If a goat or a sheep walks into a field of valerian and starts munching away, the GABA in the plant will sedate the animal so that it leaves more valerian plants alone. Irioids, such as the two valepotriates isovaltrate and valtrate are thought to be more directly responsible for the soporific effects of the plant. These compounds interact with the same receptors in the brain as Librium, Valium, and Lunesta. Isovaleric acid is the compound that makes you go "phew" or "phooey" when you smell valerian. It's also the main contributor to the taste of hops used to brew beer. Even though pure isovaleric acid smells something like cheese you left out on the counter for a week or socks you left in your gym bag, it's used to make many fine perfumes. Sesquiterpenes in the volatile oil such as acetoxyvalerenic acid, hydroxyvalerenic acid, and valerenic acid also activate GABA receptors in the brain. GABA trips the "off switch" for certain kinds of brain activity. The volatile oil can literally boil away if you make valerian tea with boiling water. Preserving the sesquiterpenes is the reason extracts of valerian usually work better than teas. There are also some chemicals that are not in the plant in nature that are formed during the process of extraction. One of them is isovalerimide. This chemical relieves anxiety and sedates the brain. It also slows down the speed at which the liver can use a group of enzymes called alcohol dehydrogenases to process alcohol, so if you take a nightcap and also take valerian, you may get more sleep than you bargained for. This chemical makes alcohol more sleep-inducing. If you drink alcohol during the evening or just before bed, use valerian with caution. >valerian fluid extract. The advantage of the dried extract in capsules is you know exactly how much herb you are getting without having to count drops. The advantage of the liquid extract is that it may work a few minutes faster. Read more about side effects of valerian. I've been writing popular and academic articles about valerian since 1995. Over the years, I have collected the questions my readers ask most frequently. I'm presenting them here with updated answers? Q. Where to buy valerian? A. Any product that is standardized for valeopotriates is fine. I am sure the publisher of this site will have a recommendation. Q.Does valerian root help you sleep if you have some serious condition like cancer? A. Actually, one of the most important uses of valerian is for treating insomnia in cancer patients who just can't take any more Vicodin or morphine. This is something I have dealt with in my own family. My mother was told she had six months to live, and she lived for 11 years by sheer determination to see her grandchildren get a start in life. She reached a point she just could not take any more hydrocodone. It had become so constipating (I am sure she would forgive my saying all this publicly if it helps someone) that we were having to take her to the ER for treatment of constipation. When she stopped the hydrocodone, her digestive tract started moving again, but she could only sleep for an hour or two each night. I started working for the American Botanical Council about this time. She tried valerian tea once, and it helped. Then she decided she wasn't going to risk anything that might conceivably interfere with an experimental cancer treatment, which didn't work. I respect that decision, as it was hers to make, and especially since the cancer drug she tried was itself experimental and herbal. But if you are not getting chemo or radiation, and you have cancer, then valerian might be a good alternative to opioid drugs that cause the horrible constipation. Q. Does valerian root help with anxiety? A. Yes, valerian root helps calm your brain so you can think up ways to deal with anxiety, or just choose to ignore what is making you anxious. What will help you use valerian for anxiety more effectively is to remember not to be anxious about being anxious. Don't take valerian and tranquillizers and a stiff drink, for example. Even if you don't experience sedation (or have a car crash) as a result of piling on more and more remedies for anxiety, you can experience a paradoxical effect. You can relax so many of your brain's higher functions that free-floating anxiety actually becomes worse. If you are using medication for anxiety, don't use valerian. 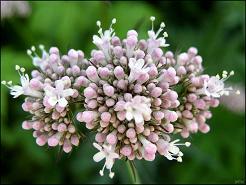 If you are using valerian for anxiety, don't use medications. I can't tell you to stop taking a medication, so what I will tell you are that valerian may be a good choice after you stop taking a medication but before you want to deal with anxiety without taking anything at all. Q. Does valerian root cause weight gain? A. If your problem is nervous eating, valerian root may actually help you lose weight. You might burn 10 to 50 fewer calories a day because you sleep better and you don't fidget, but if your calmer state helps you avoid eating donuts, Ding Dongs, and coconut cream pie, the net effect on your weight will probably be beneficial. Q. Are wildcrafted valerian products better than extracts? A. 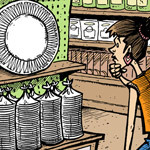 The USDA looked into the possibility that small herb shops might be accidentally making tinctures contaminated by aflatoxin. They didn't find any. The valerian extract your herbalist makes from herbs gathered from the garden is probably more potent than any other commercial product. But that just means you would take less of the wildcrafted product than a capsule or commercial tincture. Some of my best friends sell herbs from their own gardens. They are very conscientious about what they do. I encourage you to buy their products-when you are in their neighborhoods. For long-term use of valerian, it is easier to buy your product online. Q. Does valerian root affect birth control? A. If you are referring to a woman's use of the Pill, the answer is yes. The progesterone in the Pill is activated by the same enzyme in the liver that activates some of the chemicals in valerian. Women who take both oral contraceptives and valerian are slightly more likely to get pregnant despite taking the Pill. But there are many other substances that interact with the same liver enzyme so it's not a sure thing one way or the other. Some herbalists recommend valerian for women trying to conceive, but I would suggest that if you are really trying to have a baby, other natural approaches are more important. And you don't have forever to have your children! I'm not aware of any affects of valerian on male fertility. I've seen websites claiming "remarkable effects" of valerian on low sperm counts, but I think the writer just made that up. Q. Does valerian root lower blood pressure? A. Yes, slightly. If you have borderline high blood pressure and the main problem is "nerves," valerian along with other lifestyle changes might be enough to keep you off medication. I always recommend that people measure the effects of herbs and other natural treatments to know whether they are working. That is, if you really want to know whether the valerian you are taking is lowering your blood pressure, you have to take blood pressure readings. That's the step a lot of people forget.